Legislator Joshua Lafazan (left) with anti-bullying advocate Shayna Sakhai (center). Syosset, NY - November 5, 2018 - Nassau County Legislator Joshua A. Lafazan (Woodbury) joined the Long Island Coalition Against Bullying (LICAB) to celebrate their achievements in the fight against bullying during the organization’s fifth annual gala on Saturday, Oct. 20. In addition, Legislator Lafazan congratulated young anti-bullying advocate Shayna Sakhai for raising $5,000 in support of LICAB as part of her Bat Mitzvah project - funds Sakhai and her parents formally presented to Salamone and LICAB during the gala. 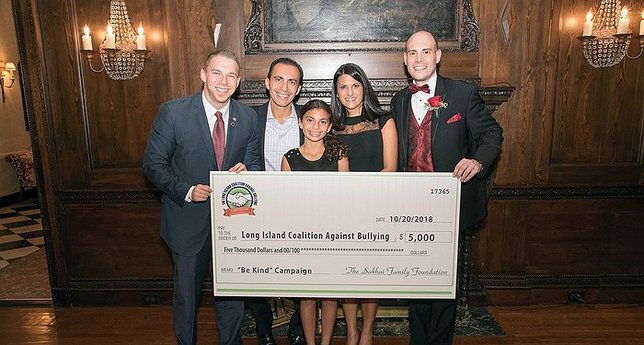 Subject: LongIsland.com - Your Name sent you Article details of "Legislator Joshua Lafazan Congratulates Long Island Coalition Against Bullying At 5th Annual Gala"